Did you all have a good weekend? Mine was very busy, but fun! On Friday evening, I saw some of my voice students perform at their high school in the musical, Footloose. I was so impressed by the level of talent and how far they have come in the years I've known them (#proudteacher)! Todd and I spent the rest of the weekend visiting his family and his mom threw me a second baby shower at her church. It was so beautiful and a really special afternoon! Today I'm styling the prettiest embroidered off the shoulder dress from LOFT. I absolutely love the feminine ties on the sleeves and the embroidered detail on the bottom! It is perfect for many spring and summer events or for date night or dinner out with your girlfriends.This dress is not maternity and I'm wearing a size small for reference. I love how the flowy style works well for my bump but I will get plenty of wear out of it after baby, too! FYI- it's on sale with an extra 40% off, bringing it down to $45. To keep this outfit soft and whimsical, I went with neutral accessories. I also didn't want to take away from the dress! 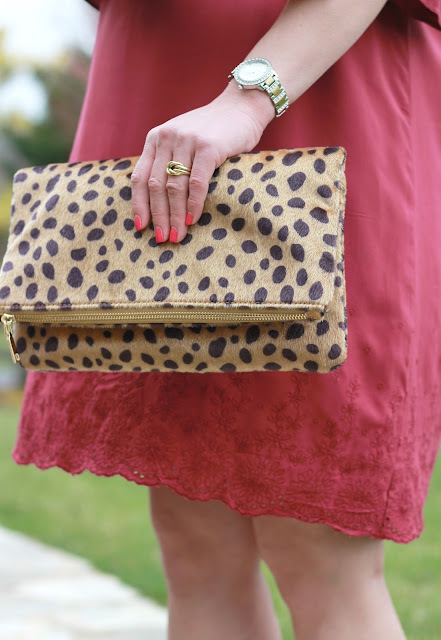 My Le Boutique Shop leopard clutch is the perfect neutral bag that adds a little extra interest to the outfit. I also really love this BP. leopard clutch from Nordstrom ($45)! I stopped at DSW the other day in search of these Steve Madden wedge sandals. While really cute, they were pretty uncomfortable! Of course, it didn't help that my feet were slightly puffy (LOL). I ended up spotting these Franco Sarto Paige Wedge Sandals and fell in love! They are SO COMFY and go with everything for spring and summer. They work well for me right now since I can slide my feet into them without bending over to buckle or tie! They are $59.95 at DSW and while a little pricey, they are worth it for the amount of wear I'll get out of them! 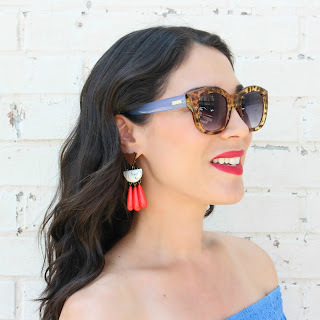 For jewelry, I wore my gold beaded statement earrings from Hazel & Deene (LOVE!) and a dainty layered gold necklace from Baublebar (similar here). Hazel & Deene has the most unique and beautiful handcrafted jewelry at great prices! Comment below if you are interested in purchasing any of their jewelry and I can put you in contact with my friend who sells. Also, my Le Specs tortoise/chambray sunnies are currently 25% off! Here's a look at the dress worn on the shoulders instead of off. I personally like both looks! It's just as pretty on the shoulders if the off the shoulder style isn't your thing. You are just GLOWING girl! I second what Carly said! You look beautiful and I love this dress. I love that the dress is just as pretty OTS as it is ON TS ;-) You truly look amazing and this dress fits you perfectly. Simply gorgeous!! I'd love for you to co-host Thursday Moda with me before you give birth. Perhaps we can schedule something for two weeks from now?! Let me know pretty mamma and as usual welcome by tomorrow and linkup with me. Happy Hump Day! Thanks Ada!! I would love to co-host your link up! Send me an e-mail at tamaradewire@gmail.com and we can go over details! You look stunning!! Absolutely stunning!! That color is gorgeous on you and those shoes are awesome!! Love love love!!! First of all, you are totally adorable!! I love it all. I'm also totally diggin' embroidery right now. And that clutch, need the clutch. Love this! This dress looks beautiful on you! Love how you styled it too!